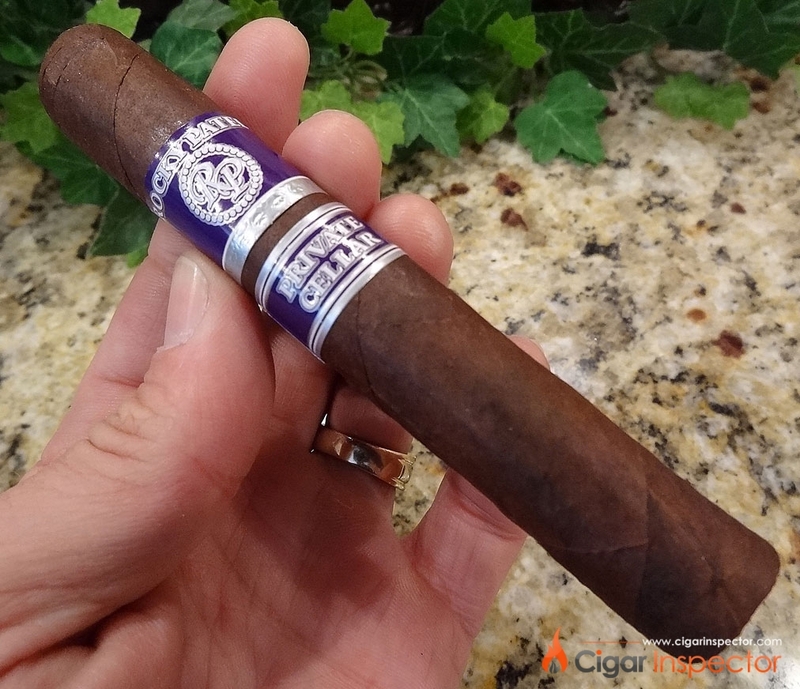 I previously wrote a review of the Rocky Patel Private Cellar Toro. In that review I advised readers that I would be sampling the Robusto to see if the size made any difference to the overall experience. Often times, the same blends in different sizes offer unique and subtle flavor differences that make one size preferable over the other even though the same tobacco is used. What I found was what I expected ... the flavor in the Robusto was slightly different. That doesn’t necessarily mean it was better. This cigar, like all of the Private Cellar sizes was rolled at Patel’s Tavicusa factory in Estelí, Nicaragua. How different was this cigar, rolled with the same tobacco and at the same plant as the RP Private Cellar Toro? The cigar was not nearly as rustic or poorly manufactured as the Toro appeared to be. Then again, using smaller Connecticut Broadleaf wrapper might have made a difference. It looked slightly neater than the Toro did but it still had visible seams. It had a slightly oilier sheen to it with a nice chocolaty wrapper and some veining present. The Robusto felt a bit firmer to the touch compared to the Toro but still had some sponginess. The burn was good to start but got exceptionally uneven as I approached the second third. Prior to that, any slight waviness in the burn corrected itself. The second half needed numerous touch-ups. The ash was flaky and flowered on numerous occasions. Be careful when smoking this cigar and make sure that the ash doesn’t fall off onto your clothes. It was anything but firm. Smoke output varied but for the most part remained average. Smoking time was roughly 1 hour and 10 minutes. The RP Private Cellar had a musty barnyard aroma to it with some subtle hints of rich tobacco and wood notes. It had a little more chocolate notes than the Toro. The cigar held up well to my straight guillotine cut and the pre-light draw offered hints of earth, leather, coffee and some spice. The pre-light draw was good. Immediately upon lighting the cigar I got a mouthful of cayenne pepper that overwhelmed my senses. I could not detect any flavors for at least the first cm as my palate struggled to rid itself of the overwhelming spice. Once this surge of spice eased I was able to get some rich maduro-like flavors. I got some nuttiness with dark chocolate and roasted coffee bean notes at the front of the palate with rich earthy undertones. There was spice at the back of the palate and the finish was medium to long, mostly consisting of unsweetened espresso and spice. The second third didn’t see much change in the flavor profile. By this point, the spice had significantly diminished and shortly thereafter was essentially nonexistent. I continued to get mainly earthy flavors with hints of leather, dark chocolate and unsweetened coffee. Unlike the Toro I wasn’t able to pick up any sweet notes. As the second third progressed I continued to pick up some cocoa, leather and more earthy notes but unpleasant hints of burnt espresso crept into the profile. Up to this point, the cigar was mainly musty, earthy and nutty with not enough “good stuff” to really leave an impression. Near the halfway point I started to taste some more enjoyable hints of chocolate, toasted nuts, sweeter coffee and sweeter woodsy notes with re-emergence of milder and more pleasing spice detectable on the back of the palate in the medium finish. The smoke itself lacked any rich velvety texture but, as I passed the halfway point, it morphed into a more velvety semi-sweat creamier cappuccino like texture with some sweeter residue on the palate. Don’t get too excited though, on both samples I smoked this pleasant area of the cigar didn't last long as by the time I reached the final third, the smoke lost that sweeter texture and became dry again. The Private Cellar Reserve is wrapped in a Connecticut broadleaf wrapper which is known for earthy and nutty notes but also for having a hint of sweetness and coffee bean notes. For reasons I can’t explain, this cigar lacked any real sweetness to balance the earthy and bitter notes of the cigar. While subtle sweetness was detected near the middle of the cigar, the other 4 inches lacked any. It’s too bad because had this cigar performed the way it did during the middle inch, it would have been a dream. The final third turned what had been an average cigar into an utter disappointment. I started to get some increased musty earthy notes with an almost burned nutty taste in my mouth. Along with dark bitter chocolate and burnt espresso the flavor mix was quite disappointing. The smoke wasn’t being rushed and remained cool so I am really at a loss as to why it became so bitter. This was true in both samples. The unpleasant bitterness became much more detectable and frequent and I really had to fight the cigar wanting to complete it for the review and hanging on to some hope that it would improve. (For the record I smoked two for this review and for the most part they both had the same flavor profile so I was sure that I didn’t just get a poor cigar). I finished the first sample for the purpose of ensuring a thorough and complete review even though the cigar became quite bitter and un-smoke-able to my palate. The second sample wasn’t so lucky. I experienced the same flavor deterioration in the second sample as I got into the final third and, with about two inches left on the second one, I put it to rest. It just became too unpleasant. To be blunt, most of the final third was dreadful. At $8.50 that I paid for this cigar I would have to say “Avoid”. $17.00 for two cigars that I utterly disliked leaves me shaking my head. For a 50x5 stick, and for essentially the same price as the Toro, IF you truly must sample this cigar, you would be better off buying the Toro and at least getting a slightly better smoke and more tobacco. There are so many better cigars for much cheaper prices. In my view, this is a prime example of a cigar price from a manufacturer who is perhaps resting on their laurels. After all these years of manufacturing cigars, I can’t accept that Patel has finally given us his preferred blend. In any event, this is a prime example that I often talk about where one has to factor into the retail price the massive advertising and promotional costs that these bigger cigar manufacturers spend. The cigar opens with a blast of spice that subsides to reveal some mildly pleasing chocolate and coffee notes but with a musty and woodsy undertone that never leaves the cigar. The flavors don’t change much and despite occasional hints of sweetness, for the most part the cigar remains somewhat one dimensional and deteriorates into an absolutely unsmokeable stogie in the final third. I find it curious that for a cigar that Mr. Patel claims he has “been working on and aging for a number of years.” (source) that he couldn’t get it right. This cigar fails on a number of levels. From lacklustre construction and appearance to poor flavors and pricing. After sampling both the Toro and the Robusto the best advice I can give readers is to just avoid this cigar. Then again, if you don’t want to take my word for it and want to experience it for yourself, grab yourself the Toro instead.